By Cath Hodsman, entomological artist. The Royal Society of Biology is running an insect life-cycles microscopy art course in partnership with Cath Hodsman on 23rd October 2015. This year celebrates a landmark anniversary that has helped define me as both a person and a professional. 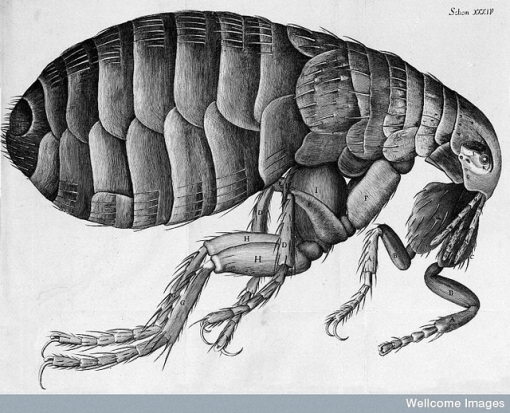 It is 350 years since the scientist Robert Hooke published his landmark book, Micrographia in 1665. To me, he is not only my hero, he is the world’s first astronaut – however, he took us on an incredible journey into inner, rather than outer-space. This beautiful and innovative book was a ground-breaking publication. Using the relatively new invention of the microscope, Hooke was able to bring the two disparate disciplines of art and science together, in perfect harmony, thereby causing a revolution and sparking one of the most advantageous partnerships in academic history. His now iconic microscopy drawings of a flea and a fly head, amongst many others, illustrate the first time the scientific world was able to travel into its own micro universe and more importantly, to record and communicate what it saw. The scientific significance of Micrographia is very apparent – its innovative approach signified a new era in science and the teaching of science. However, for me as an entomological artist, its advantages are much more wide-ranging and fundamental. Not only did Hooke excite the scientific community, he excited the whole world. His beautiful illustrations invited everyone into the previously exclusive world of science. For me Micrographia stands alone as the moment when science came within the reach of the common man. It was the moment the masses were invited to learn about, marvel over and to appreciate the invisible natural world – a fundamental leap forward in the perception of academia. 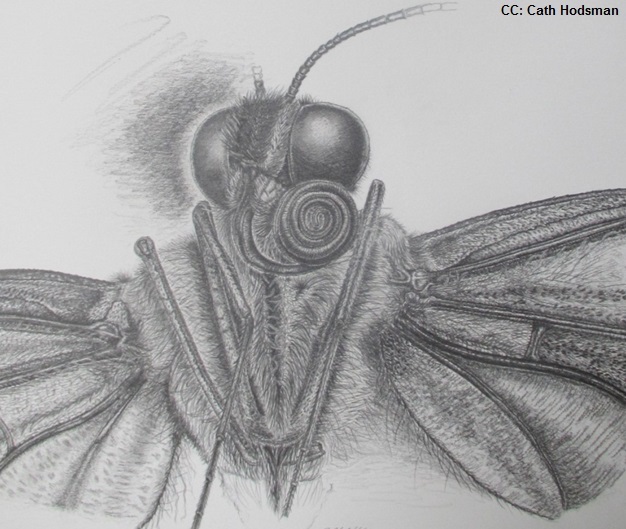 Microscopy sketch of a butterfly head (pencil and graphite). I am pleased to say that the same principles borne out of Micrographia still apply today. 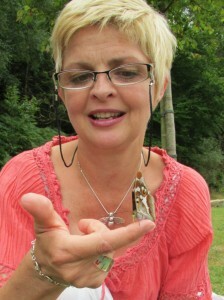 The aim of my work is to use microscopes to educate and disseminate science – specifically the micro-world of insects. In my workshops, I take my students on magical journeys into unseen and intricate worlds, such as that of the butterfly’s wing and the honey bee’s proboscis. Then I use the medium of art to pay homage to this hidden beauty and anatomical perfection. But most importantly, like Hooke’s Micrographia, this journey needs to be available for everyone. We are all borne out of the natural world and have an in-built curiosity and respect for it and this needs to be facilitated and encouraged whenever possible. One of Cath’s students studying and drawing honey bee anatomy. Unfortunately, since Hooke’s day, this scientific and artistic experience has taken on a more critical undercurrent. Our modern natural world is under enormous pressure. Pressure from climate change, habitat loss, natural resource depletion, pesticide and chemical use, overcrowding and even persecution. All these influences make it even more important to take time to understand and appreciate our invisible worlds. We need to learn that it is the smallest things in life that are the biggest things in life and without understanding and protecting them, we are all in trouble. Maybe Hooke’s most important legacy will be to help facilitate the continued growth and development of another relatively new modern and crucial discipline, that is here to stay – conservation. 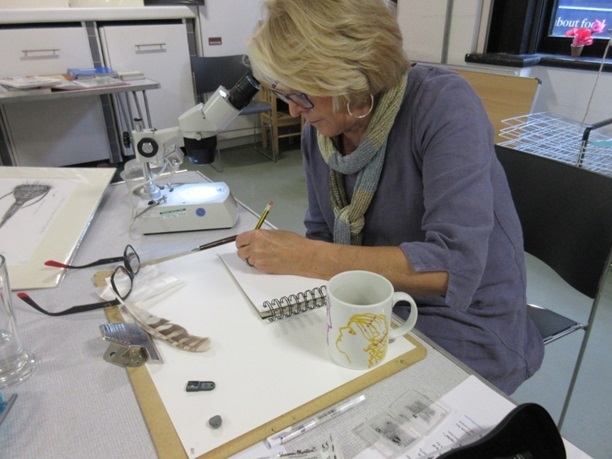 The Royal Society of Biology is running an insect life-cycles microscopy art course in partnership with Cath Hodsman on 23rd October 2015. Comments Off on Hooke, my hero. Micrographia, my Bible.